40 WEEKS! Aww this will be my last pregnancy update as I’m full term and I doubt much will change in terms of symptoms etc as I continue being overdue. I’ve gained: 4lbs/2kg since last week. It seems to be the trend throughout this pregnancy that I gain 2kgs every fortnight. I started at 54kg so in total I gained 16kg. I went over the recommended weight gain which is 12.5kg but that’s ok as I’m hoping that breastfeeding will help me lose the excess. How I’m feeling: I’ll try not to focus on the negatives of the week and all the normal aches and pains. The positives are that I’m feeling grateful that we’ve got to the ‘end’ of the pregnancy with a healthy baby. I’m hoping all will go well in labour and we will be able to have a quick and short stay in hospital before we can take baby home. I’d prefer not to be induced, as I was last time but if it has to happen, then so be it. Highlight: Andy is still off work and Annabelle’s room is starting to look really good. The horrible blue metallic paint that was left by the previous home owners is gone. Hurrah! The room looks so much brighter and cleaner now. We have chosen a really neutral coral colour that is almost magnolia but just feminine enough for a little girl and will compliment her furniture and accessories. The baby is: Staying put for now. Guess it is taking after the Denny family and coming out late. I was two weeks early but Annabelle, Andy and his brothers all arrived after their due dates. Baby is definitely not making it very comfortable for me and the longer we wait the more I nervously anticipate the labour. I’m still having really vivid dreams about going into labour too so I seem to wake up quite confused on most mornings. Food cravings: All the ‘F’s! Fruit and Fibre cereal, fruit and fluids. All relatively healthy cravings. I’m constantly hungry and having about 4 or 5 small meals a day. I’ll have cereal when I wake up, a bagel with cream cheese at about 11.30am and lunch at about 1pm. If I have a snack at about 4pm then I’ll have dinner at about 7pm. Otherwise I’ll just have an earlier dinner at around 6.30 and something small an hour or so before bed. Symptoms: Moody. I’m really not a bundle of joy to be around. I feel restless, anxious and I’m trying hard to distract myself and stay calm and positive as I know I’m unlikely to go into labour if I stress. I also have a weird metallic taste in my mouth, a bit like in the first trimester when I felt really sick with hyperemesis gravidarum. My body: Not much change here. Everyone says that I’ve got a ‘pointy’ bump as it is all concentrated at the front and there isn’t much on the sides. My last pregnancy bump was a lot more round and I think it was a lot more fat and less of the baby’s weight. Any mood swings? Eugh! I’m a moody so and so! 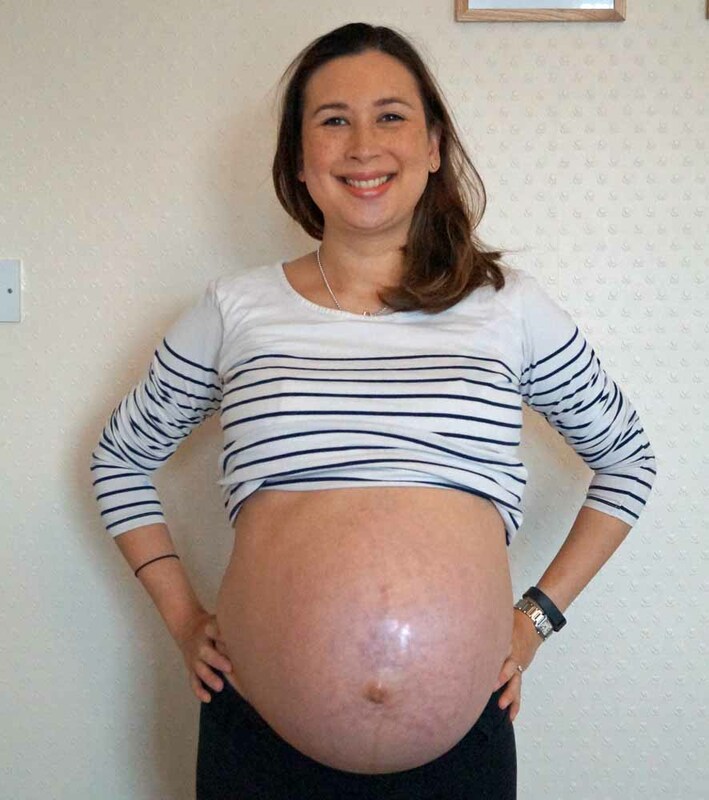 I’m looking forward to: A natural and quick labour… Pretty, pretty please! I am 40 weeks but have been a bit busy so apologies for the late posting of this update. 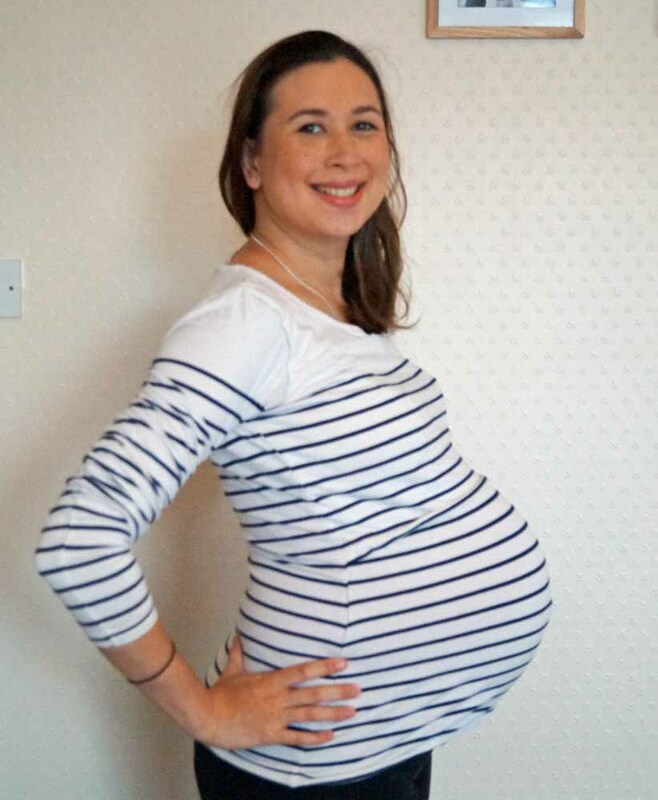 I’m wearing: A nursing top from JoJo Maman Bebe with maternity trousers from Mothercare. 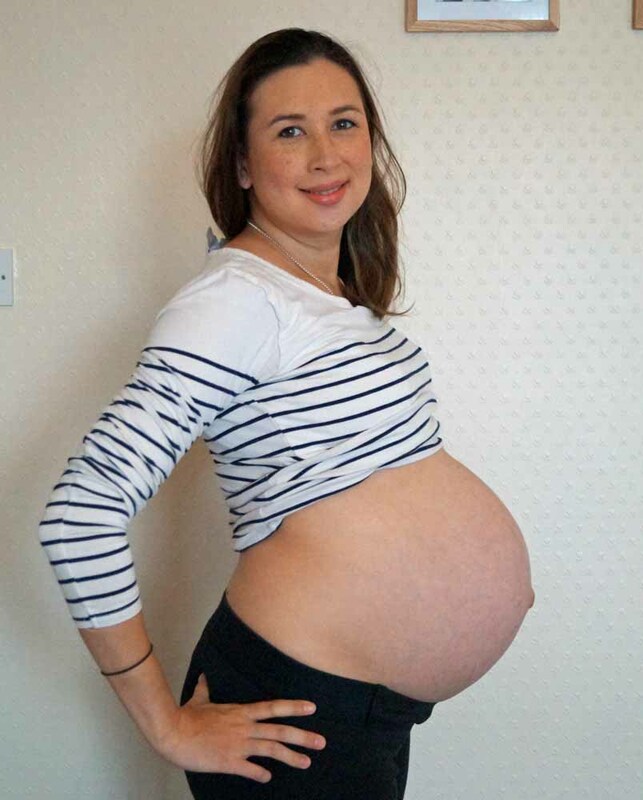 I wore this top in my 34 Week Pregnancy Update. The trousers were purchased three years ago during my last pregnancy but I haven’t needed to wear them a lot this time as I haven’t needed any smart, workwear. I’ve basically lived in jeans. I’ve gained: No weight gain since last week but I feel so hungry so I’m surprised I don’t weigh anymore. How I’m feeling: Really, really tired and achey. I have all the practice symptoms of labour but no signs of baby yet. Just really random Braxton Hicks that vary in intensity throughout the day. I have a lot of cramps and lower back pain. Frequent trips to the bathroom throughout the day and night, as I’m guessing baby is poking at my bladder a lot. There isn’t much room in there as I see a lot of limbs pushing at my belly as it wriggles around. Highlight: Andy has been off work for half term so it’s been nice to have him around. We are currently in the process of converting the second room into Annabelle’s bedroom so the baby to go in to the nursery in the New Year. The double bed has gone and we need to buy a single bed for Annabelle once Andy has finished painting. The baby is: Well should be, about 7lbs now. It should have a good covering of fat too. Any time it would like to come out, we’re ready and waiting! Especially my auntie who is visiting from Thailand. I’m really hoping she can meet the baby before she has to go home. She’s had a great time with Annabelle and helped increase her Thai vocabulary and understanding too. Food cravings: Still fruit and also vegetables. I’m really enjoying lime pickle, poppadoms and peshwari naan at the moment. Symptoms: Tiredness, achey bump and lower back and lots of Braxton Hicks. I still can’t walk very far or for long periods of time and getting up the stairs takes a lot of effort but at least my hips aren’t too bad in terms of aches and pains. I’ve started to feel and look a bit more puffy meaning I’ve to take off my watch and wedding rings when I go to bed at night. I do seem to be quite warm when I sleep and tend to kick my covers off a lot and get overheated when the heating comes on in the morning. My body: I feel huge and very unattractive. My belly looks unsightly with all the purple marks, veins and stretch marks. I’m rubbing lotions and potions in regularly in hopes that they’re not permanent. Any mood swings? Yep. I’m so tired, uncomfortable and moody. I’m looking forward to: Going in to labour… very, very soon!